He says the army is the main guarantor of Ukraine's future. 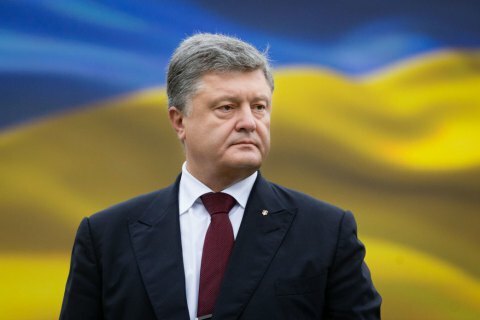 President Petro Poroshenko has said Ukraine was not given independence 25 years ago, it "won it by intelligence, sweat, and our blood". He was speaking at the military parade in Kyiv on the occasion of the 25th anniversary of independent Ukraine. "A quarter of a century ago, we chose our independent future. We had organized the event which Putin eventually named 'the largest geopolitical catastrophe'. However, those days we did not dare to break without compromise with the past. We got lost in the arrows of the multi-vector policy trying to keep a foot in both camps," he said. "A constant lookback to Moscow and a belief in mythical brotherhood, paternalism and socialistic stereotypes firmly settled in the public conscience hampering the movement like weights on the legs." According to Poroshenko, the Armed Forces are the main guarantor of Ukraine's secure future. "This is far more compelling argument than the Budapest Memorandum," he said. "Looking back to over two years of the war, we can state with certainty that the enemy failed to achieve any of its strategic objectives and failed to bring Ukraine to its knees," Poroshenko said, noting that 2,504 servicemen perished for this. In his words, the EU-Ukraine Association Agreement is already working gradually compensating "the incredible losses inflicted by the war and the economic aggression of Russia". "Moscow tries to strangle us both by closing its market, and blocking transit to other countries. Against the background of unprecedented external shocks, we achieved macroeconomic stabilization and restored economic growth," he added. Poroshenko found some special words for Ukrainians in Russia-annexed Crimea and occupied Donbas. "My separate greetings on the occasion of Independence Day go to Ukrainian patriots in annexed Crimea and occupied Donbas. My dear, we love you and try hard to have you returned to Ukraine. We are doing this by means of political diplomacy because we care about you. This is the Kremlin that perceives your land as the theatre of operations, and the region’s civilians as cannon fodder to satisfy their imperial appetite. While for us, you are ours, near and dear ones, temporarily separated from your Ukrainian family. The family which will definitely unite and meet at the festive table," he said.